Who is Tom Jane Punisher? Don't you know? Are you stupid? 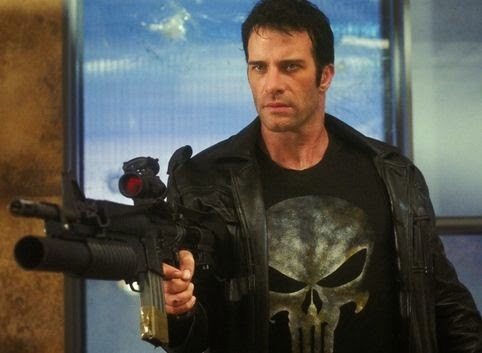 2004 saw the cinema classic Punisher movie, starring Tom Jane. Tom Jane Punisher was awesome, as he attacked villains with ice lollys, and spent lots of time building cars only to have them smashed to bits a moment later. I got very excited when I heard there would be another film starring Tom Jane Punisher. Apparently he would be fighting a living jigsaw or something. But then my mind began to wander, and I found out the truth - that it would be a film entirely about Tom Jane Punisher's attempts to steal ice cream from a polar bear armed only with a gigantic spoon. Now, one of my friends got very upset that Free Comic Day was not happening in Birmingham where we live. So he asked me to make him a comic starring Tom Jane Punisher, the Hulk and a dragon. The results are below. And I think you can all agree... its best that it is free! [Turtlewind] Kiss of the Turtle! Visionaries - Knights Of The Magical Light!